This is what Backyard Weddings are all about — we think Aimee and Joe’s wedding has been executed beautifully and we’re excited to show you all! This has to be one of the most special weddings we’ve stumbled upon; engaged and married in the family backyard, with beautiful flowers picked straight from the garden. Joe and I met at intermediate school but we didn’t start dating until we were 18 years old. He asked me to marry him on Christmas Day 2016 at Corbett House (my mum and step dad’s place). Since he asked for my hand here it was a special place to get married also! Hikutaia is a small town located between Thames and Paeroa, New Zealand. Corbett House is a 1920s historical home which is both a family home, Bed and Breakfast plus venue for various events. Not only is it a beautiful house the gardens are stunning. A perfect fit for our rustic themed wedding! 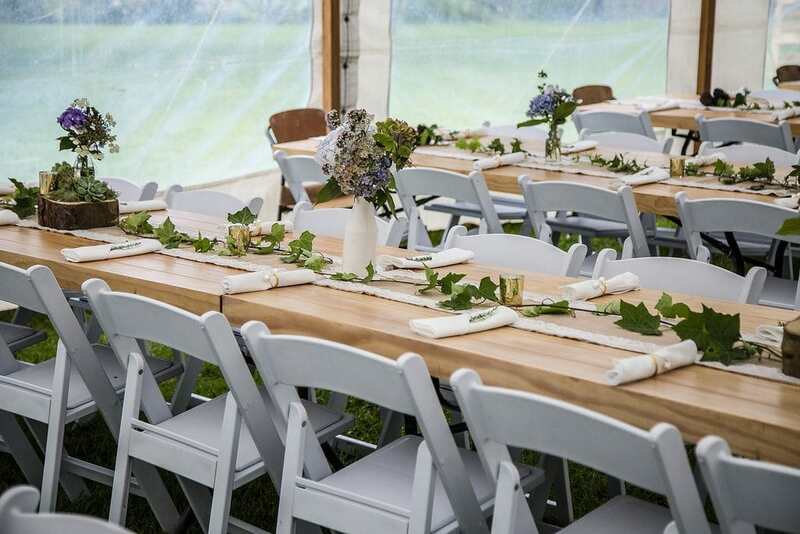 It took us a year of planning and our main focus was providing a relaxed, fun wedding with good food for our closest friends and family members. I wasn’t fussed on the little details of decorating etc but I was lucky to have one of my bridesmaids help with the styling using items left over from her wedding. The best things about having a backyard wedding here was the relaxing environment for us and the guests, plenty of room for kids to run around, lots of fresh air and the wonderful gardens to look at. There was plenty of space to set up everything (marquee, caravan, games) and shade / shelter from the big trees in the paddock. Our biggest challenge was the unpredictable weather of the New Zealand summer! We wanted to get married under the trees but we had a back up plan to hold the ceremony in the marquee if it was raining on the day. Although it was warm we had LOTS of rain leading up to the big day but were lucky enough to only get a shower or two on the actual day so we did have our ceremony under the trees. We hired a marquee from local based company Make Your Day Events. Taryn and her team were INCREDIBLE! They put up the marquee on the Thursday prior to the wedding so we had time to do our own decorating. We also hired all the chairs, tables, flower wall for behind the bridle table, dance floor, fairy lights, chair sachets, table runners, cake table and skirting from them. My sister and her partner are both chefs so they did a grazing platter for our guests to help themselves to after the ceremony (while we were getting photos taken), there was also lawn games to play (hired from a company called Just Hitched Ltd) and we also had a rustic caravan serving drinks to keep everyone refreshed (One Little Wagon). When it came to the evening the Southern Spit Roast Company put on a buffet dinner. Having a buffet was a great idea as guests could help themselves to the selection. We also hired a chiller trailer to keep the drinks cool and portable toilets. I wasn’t fussed on the little details of decorating but I was lucky to have one of my bridesmaids help with the styling using items left over from her wedding. Also my bridesmaids and a few other family members pitched in the create lovely flower bouquets on the day so we didn’t have to pay for flowers or a florist! All of the flowers arrangements were made with flowers from around the property. The bridesmaids dresses I found on a recycled wedding Facebook page and have resold them on since the wedding. The groomsmen and my husband got there suits from Barkers. Hair was done by my friend Kareena who has a salon in Beachlands she was also a guest at the wedding so it worked out well! Make up by Susan from A New You (based in Paeroa). They both were so lovely and came to Corbett House to help us get ready. Our photographer was Mariska Styne photography, also based in Beachlands. We won a engagement shoot with Mariska before the wedding and she did the most amazing pictures so we booked her for the wedding. All 3 of the ladies mentioned above did an incredible job on the day, they were all so easy to work with an had a lovely energy. My step grandfather was our officiant and the wedding cake was made Bayleigh from Bakealicious (another friend of mine who was a guest at the wedding). Having all of these people who were friends or family take part in our wedding make it extremely special! I didnt’ have just one favourite memory of the day but the most special parts included the feeling of love from our family and friends being there all together, my dad walking me down the asle of trees and of course seeing Joe waiting there for me. My sister said a beautiful poem and my husband did a very heart warming speech. As you can tell, there are soooo many favourite memories I will cherish forever from our wedding day! Our save items were our outfits and we didnt go overboard on decorating / styling the event (as above with the flowers etc), we didn’t spluge on anything really but it was important to have nice food, a good marquee and the cute little caravan serving drinks was worth it. I don’t have any advice for others as each wedding is individual! I would however recommend a backyard wedding if you like the outdoors and don’t mind what the weather will bring on the day.